Nestled on the banks of Lake Travis in Texas Hill Country, the 168-room Lakeway Resort and Spa creates a distinct getaway bordering the urban allure of adjacent Austin. Beckoning guests with lakeside diversions of sailing, boating, fishing and water activities across 65 miles of lakeshore, the AAA Four Diamond Award resort, named the No. 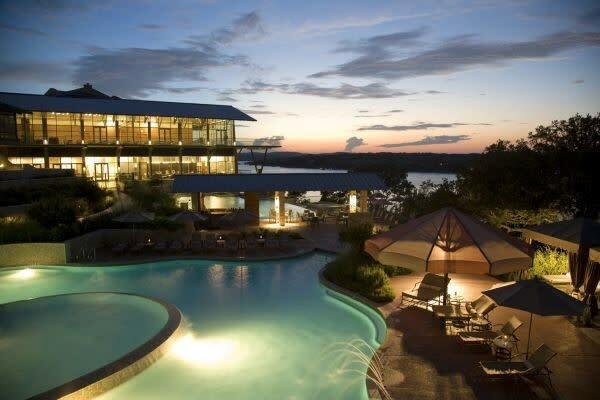 15 resort in the Southwest by Condé Nast Traveler and the only resort on Lake Travis, boasts a boutique spa with significant lake views, a Kids Zone recreation center, a pool playground featuring an adult-only oasis with swim-up bar and a zero-entry family-friendly pool with waterslide. Extensive meeting and event space includes an impressive glass ballroom with stunning vistas from every angle. Description With commanding views of the Texas Hill Country from the shores of Lake Travis, Lakeway Resort and Spa captures the elegance of a charming destination with contemporary resort amenities. Space Notes AAA Four Diamond Award-winning Lakeway Resort and Spa is widely recognized as one of the top meeting destinations in Texas and is an Elite Meetings Gold 2011 recognized hotel.